Resilmount A48R sound isolation brackets are designed to acoustically decouple walls from building structures. Use to brace an acoustic wall to the structure without compromising sound and vibration transmission requirements. 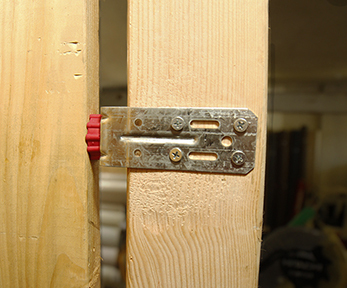 This is an ideal technique to use when building a room within a room, or when bracing a wood or steel stud wall apparatus against a concrete building structure. A48R brackets have a simple, yet effective design that can be adapted to a plethora of applications. In one such application, A48R brackets can be used to as mounting brackets for suspension rods in a suspended ceiling apparatus. 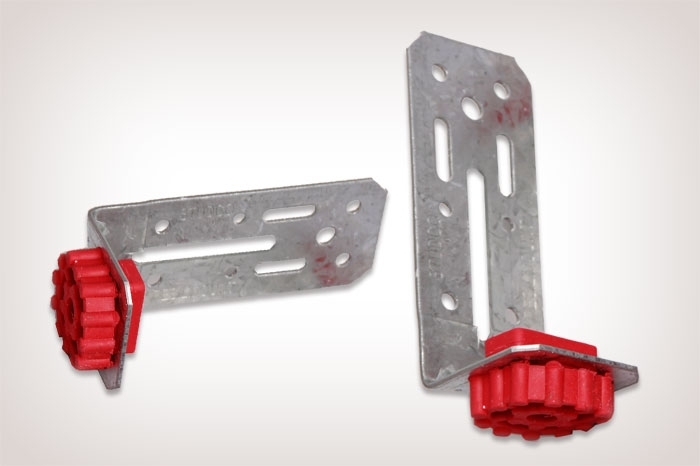 Resilmount mounting clips and brackets are effective at reducing sound transmission through buildings, as well as quick and easy to install. 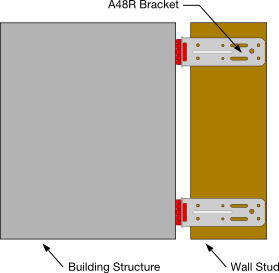 The A48R bracket incorporates a simple design that is applicable to a wide range of soundproofing installations, including multi-family housing, mixed-use commercial, studios and home theaters. Resilmount's patented thermoplastic rubber outperforms standard rubber because of its unique natural absorbing characteristics. Resilmounts unique sound cell design guards against structure-borne vibrations transferring into the body of the Resilmount because of its strong column design providing a small percentage of contact surface area with the structure or substrate it is fixed to. This aids in absorbing and breaking up airborne sound at its transfer point. Width: 1 - 9/16 in. Height: 4 - 5/16 in. • A48R brackets come with several 3/16” slotted holes in bracket fixing surface, suitable for direct fixing or inserting suspension rod for suspended ceiling systems. • Simple design makes the A48R brackets adaptable to hundreds of applications. • A48R brackets come with 1/4” holes for most common fixings. • A48R are to be only fastened into substrate by a minimum #8 screws or masonry sleeve anchors. (See fasteners manufacturers specifications). • When using in ceiling applications, always check load ratings with Resilmount’s engineers prior to installation. • Do not overtighten wall fasteners. Ideal maximum torque 45Nm. Construct wall stud assembly prior to installing the A48R brackets. Measure for placement of Resilmount A48R sound isolation brackets on the wall studs (steel or wood). A48R brackets should be spaced 24" apart. Fasten the brackets to the studs using appropriate fasteners. DO NOT fasten Resilmount brackets to framing members with nails. Fasten the bracket such that the long side of the bracket is flush against the stud and perpendicular to the length of the stud. (See installation notes). Raise the wall assembly into place. Fasten the bracket to the building structure through the hole in the resilient rubber. Use appropriate fasteners for the building structure material. Raise the drywall into place and fasten to the wall assembly with standard drywall screws. Use acoustical sealant to fill the gaps around the perimeter of the wall and use putty pads around any electrical outlets.